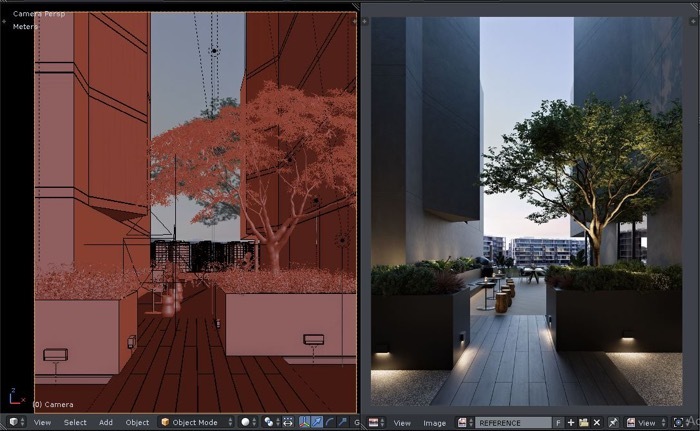 A couple weeks ago I got a message from one of my readers here in Blender 3D Architect asking about exterior renders. If Blender could also produce external renders for architecture, because we only post projects with interiors. If you take a detailed look at some of our old posts you will find a lot of great examples of projects from exteriors. Just like this incredible external render called “Common Area” from artist Rio Suryonugroho. You will find all details and several renders in this thread at the Blender Artists forums. One of the highlights of the project is the uncommon lighting. In most cases, you will find external renders using a bright daylight setup. For this particular project, the artist uses a very environmental light with artificial light sources in the scene. Besides being a great example of artwork produced with Blender, you will also find some Information about the settings used to achieve this light effect. From the color management options, he also uses the Curve Editor. Do you want to get even more detailed information about lighting settings for Cycles? Don’t miss this article where you will find an explanation about the light setup used by the artist.